Batman: Arkham City is almost mythical in its pedigree. 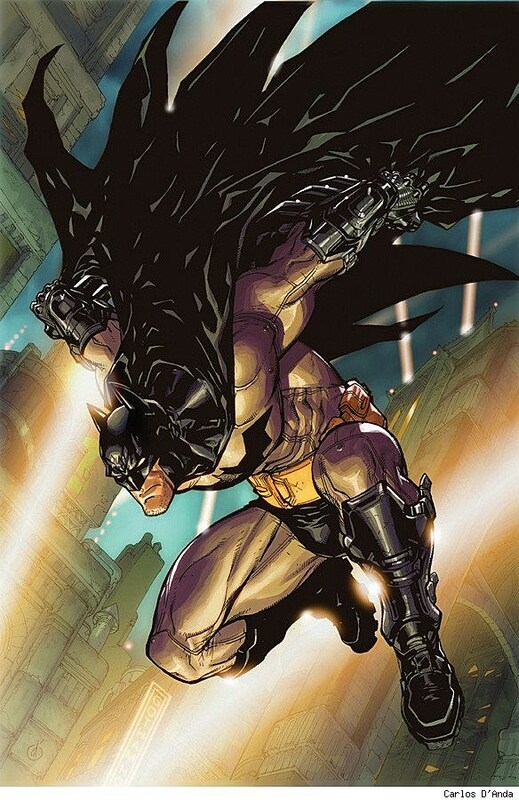 Not only is it the sequel to what many consider to be the best licensed video game of all time (Rocksteady Studio's Batman: Arkham Asylum), it also exists in comic book form as a six-issue monthly miniseries from DC Comics written by Paul Dini and illustrated by Carlos D'Anda, two of the games' principal authors. On top of that, Batman: Arkham City is one of the few comics from a major publisher to be released for sale digitally day and date with the "paper" version. ComicsAlliance had a chance to talk with Carlos D'Anda about his work on the Arkham City game and comic book. Among the things discussed were the differences between working on a comic and a video game, the contributions of Paul Dini, and digital comic book distribution. 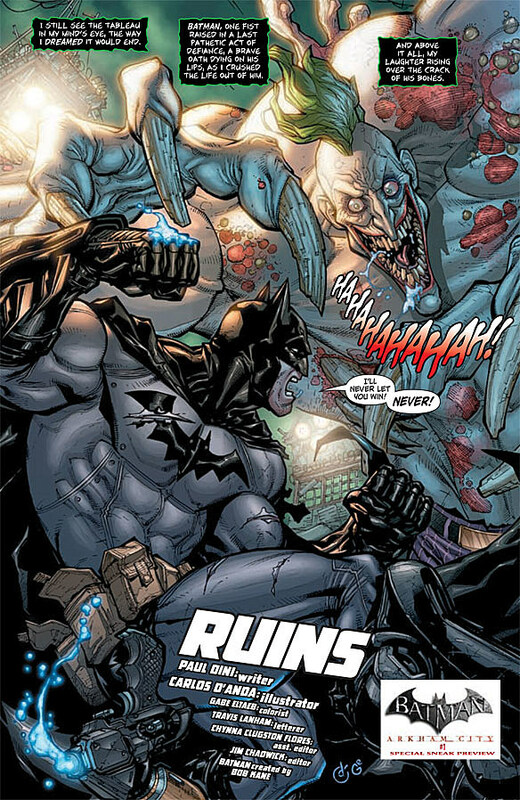 In addition to the digital versions of Batman: Arkham City, DC will release exclusive eight-page "digital interludes" in between the monthly issues, further fleshing out the story. The project represents a promising synthesis of what may come in the future, a seamless thread connecting traditional comics with digital media and culminating in a fully interactive video game. 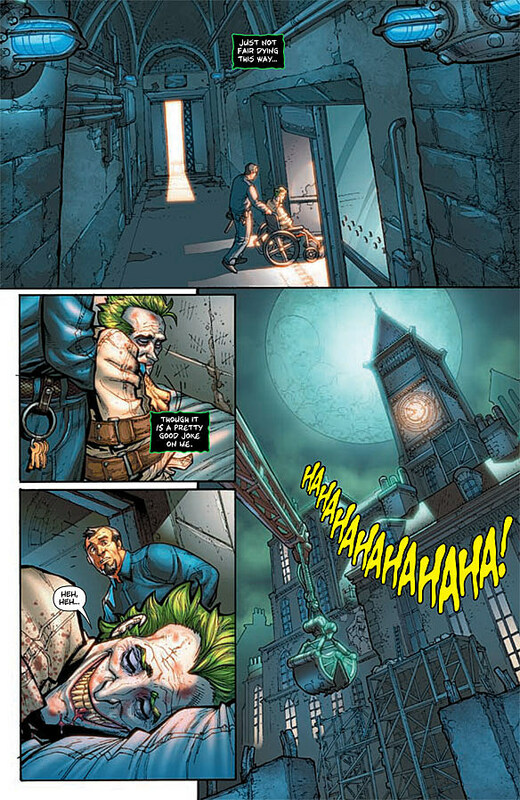 The Arkham City game releases on October 21, but fans can prepare themselves in the months before by reading the DC Comics miniseries that D'Anda says provides integral story elements bridging the plots of Arkham Asylum and Arkham City. ComicsAlliance: Batman: Arkham Asylum is widely considered to be one of the best licensed video games ever, and certainly the best superhero game ever. Why do you think Rocksteady Studio succeeded where so many others had fallen short in the past? Carlos D'Anda: Most of the time "superhero" games are made to piggyback on a movie franchise and they are usually rushed to meet a release date, a toy line, etc., so the developers don't always have the time necessary to really do something special with that comic book character or characters. I believe Rocksteady did an amazing job not only because they are a studio full of very, very talented people, but also because they were given the time to do a game worthy of Batman. Not only did the game look beautiful, but the fighting engine was incredible; it made you feel like Batman, like you could take on 20 goons at once. That is the thing that will stick the most with me, the controls were damn near flawless; so smooth from the blocks to the hits to the throws. Then you had the voices! Most people of my generation grew up with Batman: The Animated Series, so hearing [Kevin Conroy as Batman and Mark Hammil as The Joker] was the frosting with a cherry on top. 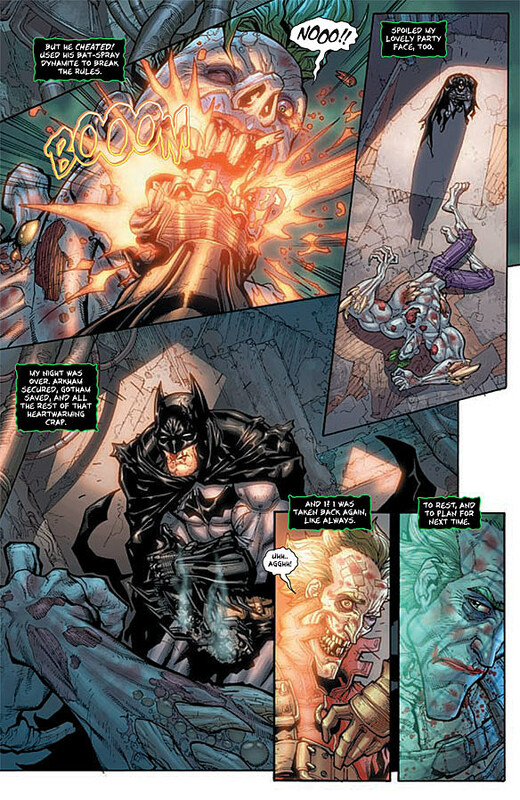 CA: How required of a reading will the Batman: Arkham City comic be for fans of the games? And will readers have to have played the games in order to enjoy the miniseries? CD: I feel the comic and the games are very interwoven, so in order to really enjoy the comic, it sure helps to have played the first game. 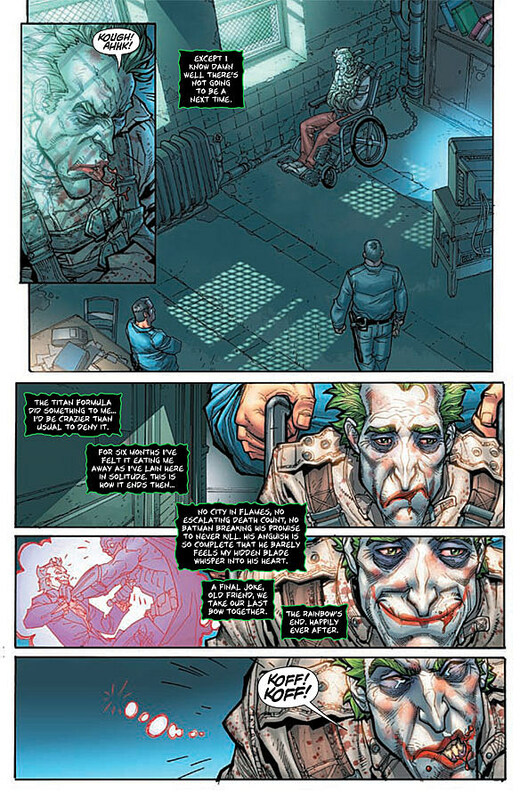 And if you loved the first game, the comic will fill you in on more of the story and give you more background of how Arkham City had its origin, what happened to Joker and Harley, etc. This series is meant to be a bridge between the two games, so I'd say it's definitely a nice complement to the "Arkham Universe." CA: One of the latest trailers for the Arkham City game shows off a brand new costume design and look for Harley Quinn. What was the thinking behind this, and did you have any concerns over changing the design of a character that has rarely had her iconic look tinkered with before? 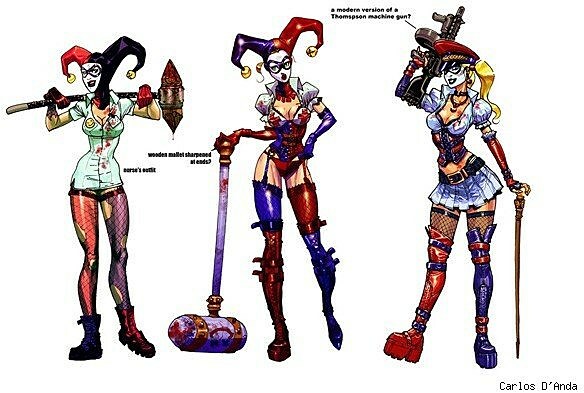 CD: In the first game, it was easier to "justify" the change of the outfit for Harley, since the initial idea was that Joker was also going to be dressed more like a crazy doctor. That is the original reason why Harley is dressed like a nurse of sorts, so story-wise, it made sense. For the second game, I must have done about ten or more different designs, and some were much closer to the comic book outfit. But in the end what made the most sense was something that (I hope) brought together the aesthetics of the comic book Harley and the Harley from Arkham Asylum. My mindset in general when I did designs for both Arkham games was, "This needs to look mean, durable, and kinda scary." When I think about Gotham City, I keep thinking of steel, leather, lots of rain, Gothic architecture, and cars that guzzle lots and lots of gas! CA: You've worked with Batman: The Animated Series writer Paul Dini on both Arkham games and now the Arkham City comic book. As a big fan of Batman: TAS, that must have been a fun experience? CD: Paul is one of the premier Batman writers. He's been living with these characters for so long that he knows how they think, feel, how they speak. I am convinced that a part of Paul's brain actually lives in Gotham City, so working with him in this is not only an honor, but very very fun. CA: Now that you've worked in games and comics, what differences, challenges and strengths have you observed about the two mediums? CD: Mainly, in games you tend to focus on one thing at a time: a character, an environment, a vehicle, and you have a bit more time to "soak" in a specific idea and evolve it. In comics, you have to be able to draw anything and everything in a page, and also do it with crazy deadlines most of the time, which in itself really tests you as an artist and is very satisfying for those same reasons. You also get to tell a sequential story all by yourself, so it's like making a little mini-movie. Both mediums are very satisfying for different reason, I am just a very lucky man in being able to work in both sandboxes! CA: The Batman: Arkham City miniseries is one of few titles to ship day and date with a digital version of the comic retailing for the same price as well. Can you give us some of your thoughts on where comics distribution and consumption is headed? CD: I think we are at a major turning point in publishing, especially for periodicals. I don't think that printed comics and books will go away, but I do feel that digital comics will become more and more common, and with cool new gadgets like the iPad -- if you ask me, comics are made for that kind of technology. I am not a purist when it comes to my comics. I feel I am in the business of storytelling, so whatever medium makes it easier for our stories and character to get to fans, why resist it? CA: What's coming up next for Carlos D'Anda? CD: A looong vacation after I am done with this series! Batman: Arkham City #1 is on sale now in comics stores, online retailers like Things From Another World, and digitally from the DC Comics app. For more Carlos D'Anda artwork, check out our gallery of his concept art for Batman: Arkham Asylum.